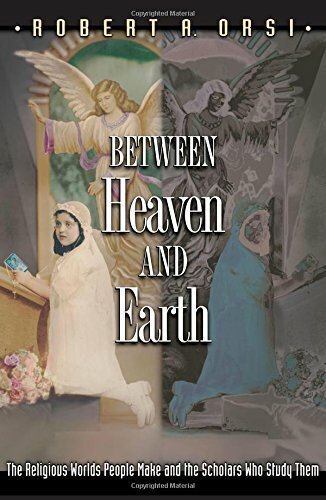 Between Heaven and Earth explores the relationships men, women, and children have formed with the Virgin Mary and the saints in twentieth-century American Catholic history, and reflects, more broadly, on how people live in the company of sacred figures and how these relationships shape the ties between people on earth. In this boldly argued and beautifully written book, Robert Orsi also considers how scholars of religion occupy the ground in between belief and analysis, faith and scholarship. Orsi infuses his analysis with an autobiographical voice steeped in his own Italian-American Catholic background--from the devotion of his uncle Sal, who had cerebral palsy, to a "crippled saint," Margaret of Castello; to the bond of his Tuscan grandmother with Saint Gemma Galgani. Religion exists not as a medium of making meanings, Orsi maintains, but as a network of relationships between heaven and earth involving people of all ages as well as the many sacred figures they hold dear. Orsi argues that modern academic theorizing about religion has long sanctioned dubious distinctions between "good" or "real" religious expression on the one hand and "bad" or "bogus" religion on the other, which marginalize these everyday relationships with sacred figures. This book is a brilliant critical inquiry into the lives that people make, for better or worse, between heaven and earth, and into the ways scholars of religion could better study of these worlds.